Originally all Passamaquoddy-Maliseet place-names were either nouns with a locative ending or, more often, verb forms with a locative meaning. Each of these place-names describes a particular natural feature of the land or water. The description may apply to a prominent, extended feature, such as a river or island, or a small, local feature, such as a mudflat, rocky outcrop, or shoal. Place names mean literally in, at, or to the place where. The following are approximate translations. Some of the place-names on the accompanying maps are native-language versions of the English or French names (borrowings, translations, or a combination of these). The literal meanings of some of the place-names still known and used have been lost. 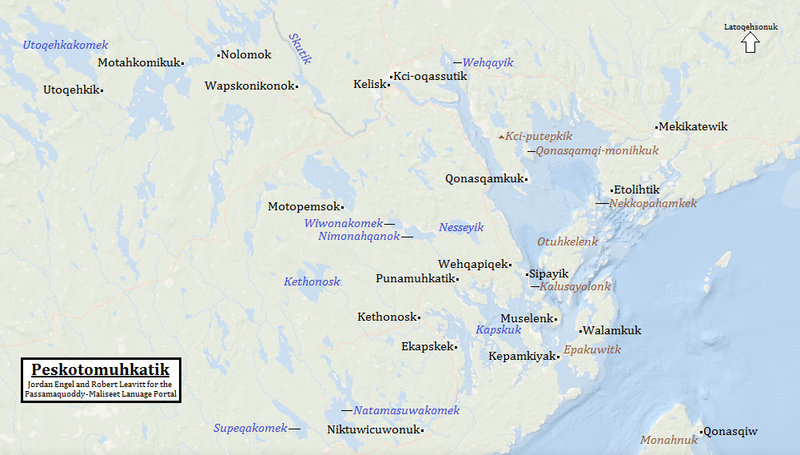 In addition, it is often difficult to reconstruct original Passamaquoddy-Maliseet place-names from the English versions, because of changes in pronunciation and the shortening of long native-language words. For example, the original name of Saco, Maine, keeps only the first two syllables of Sakotiyamkiyak; and the name Metaksonekiyak (meh-tahk-suh-NEG-ee-yahg) became Meduxnekeag (meh-DUX-nuh-keg) in English. 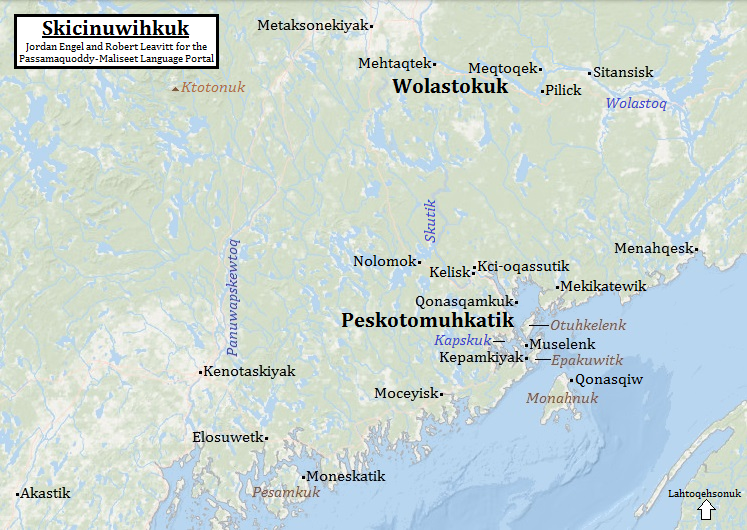 Although pronunciations may have changed, Maine and New Brunswick still use a great many of the Passamaquoddy and Maliseet place-names learned by early European visitors to Peskotomuhkatik and Wolastokuk. The cardinal directions in Passamaquoddy-Maliseet are also named descriptively, some with reference to a prevailing wind. Orientation to a south-facing coast is reflected in the following words, used to describe the changing length of the day as the year progresses. For additional place-names and geographic terms, see the online Passamaquoddy-Maliseet dictionary at http://www.pmportal.org.